Yellowstone National Park is the oldest national park in the U.S., spreading over 3,500 square miles with a varying landscape that beckons to be discovered. Families with young kids will find a plethora of things to learn about and explore, such as forests, canyons, waterfalls, geysers, hot springs, thermal pools, wilderness, as well as all the animals that call Yellowstone home. 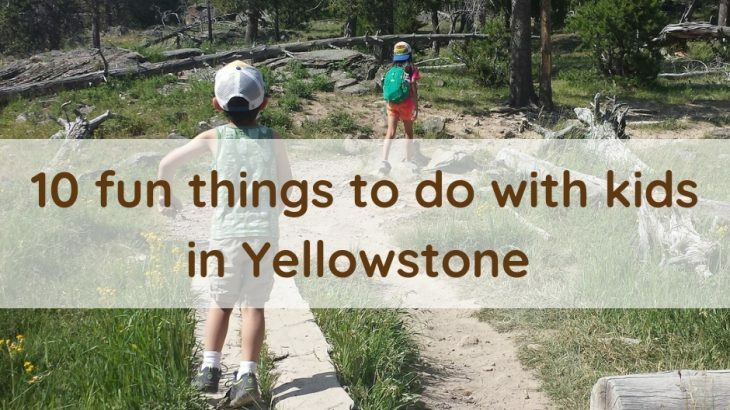 Our family spent a week in Yellowstone National Park (and Grand Teton) and below are places we recommend for families with young kids based on our itinerary. It includes hiking, swimming, sightseeing and learning opportunities; however, there were some places we couldn’t fit in with our limited time. But first thing’s first: Yellowstone is a big park, so plan ahead to make the best of your time (and money) there. Here are some tips for planning your trip to Yellowstone. You can fly into Jackson Hole, WY (the closest to Grand Teton); Idaho Falls, ID (two hours west of Yellowstone); or to sacrifice a longer drive for more affordable fares, Salt Lake City, UT, is five hours south of Jackson Hole. There are many options inside and outside the park. We opted to stay inside Yellowstone at different areas of the park to avoid long lines at the gate and for easy access to parking (lots fill up quick if you don’t get there early!). This also allowed us to take it easy and explore at our leisure. Accommodations inside the park vary depending on your needs and budget, but it’s advised to make reservations up to a year ahead. Tip: If you decide to stay outside the park, get an early start as it could take two hours or more to get to the park, get past the entrance and drive to your destination. With all that time driving, most people only see Old Faithful and a few boardwalks then have to head back out before nighttime. Yellowstone has five entrances with a road system built in the shape of an 8, so decide which direction you’ll take then plan your attractions. We came up from Grand Teton (south entrance) and did a counterclockwise loop through West Thumb, Mammoth Hot Springs, Madison, Canyon Village and Old Faithful, then exited via the west entrance to West Yellowstone, ID. The weather can be unpredictable and change between the four seasons in the same day, so pack layers you can easily take off or put on. Sunblock and a hat are also important, as is bug spray – some areas are ridden with mosquitos. 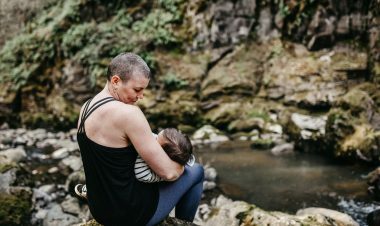 And if you have a kid who likes to wander off or isn’t steady on his feet, a carrier is a better choice than a stroller as boardwalks get crowded and it can be frustrating getting around. Something you’ll also have to consider is if you’re going to pack food in or buy them in the park. We cooked most of our meals, so we packed two coolers where, inflight, one held hiking gear and a small butane cooktop, and the other had our clothes and a foldable duffle bag to transfer clothes into later. Once we got groceries, one cooler held our pantry and cooking items and the other held our cold foods. If you go this route, make sure you visit the park’s website to get a list of designated picnic areas. Here are some additional tips on ways to pack snacks for a road trip. Note: If you plan to hike, carry bear spray. These can be purchased inside or outside the park. (We compared prices and it was cheaper in town than at the resorts or the parks.) And if you end up not using the bear spray, leave it with a park ranger; they always appreciate the extra supply. If you only visit the more popular, crowded areas, you won’t need bear spray. West Thumb Geyser Basin borders Yellowstone Lake on the south and is a short walk on a boardwalk that offers impressive hydrothermal features – pools as blue as the sky and so deep it feels like you’re looking into a bottomless pit. 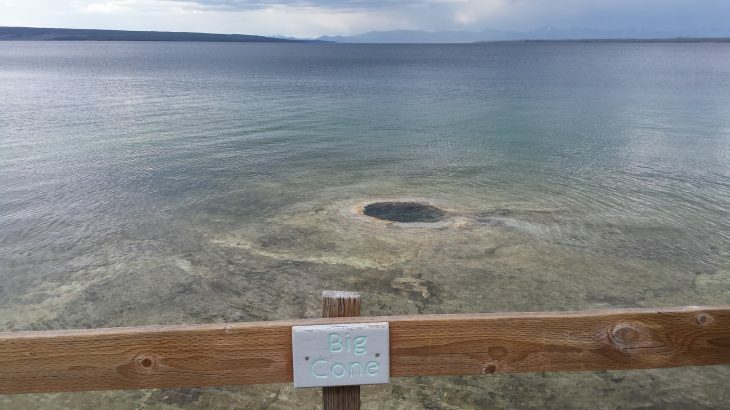 There are even thermal features located IN the waters of Yellowstone Lake, such as Big Cone. This is an easy walk for littles and a great introduction to the park if you start your adventures from the east. 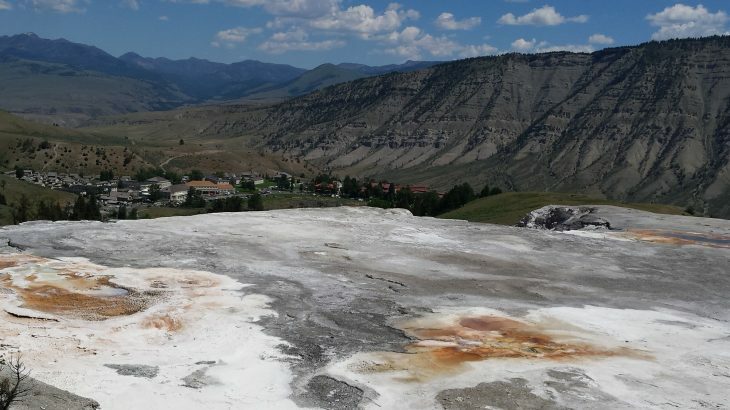 Located at the north entrance, Mammoth Hot Springs is where the park headquarters is located, and due to its lower elevation, it’s accessible year-round. 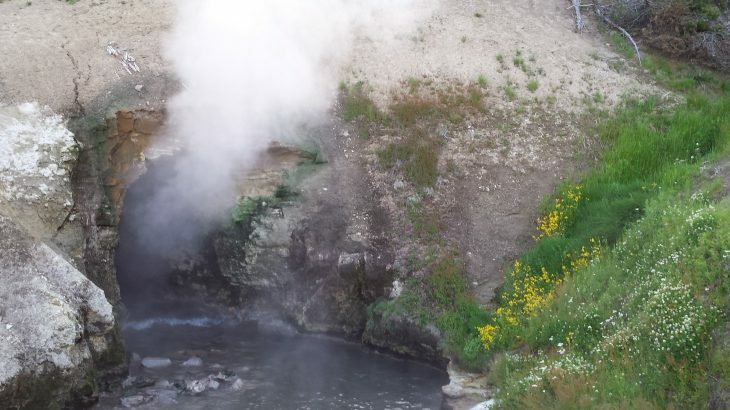 Drive along the upper terrace and check out the travertine terraces, then walk around the boardwalk at the lower terrace and check out the steaming hydrothermal features. When you’re done, grab a bite to eat and visit the Visitor Center. There are a few kid-friendly hiking trails nearby that lead into the wilderness, but bring sun protection (sunblock and hats) as there’s hardly any shade. And carry lots of water! If you have time, head out the north entrance to visit the Roosevelt Arch and walk around the town of Gardiner, MT. If you want a wide view of the Grand Canyon of the Yellowstone, Artist Point is your go-to. Located on the edge of a cliff on the south rim, the overlook gives you a panoramic view of Lower Falls and the river running through the canyon walls. If you want to experience being inside the canyon walls, Uncle Tom’s Trail is nearby. Follow the South Rim Trail, which is paved with a few switchbacks, until you reach the trailhead for Uncle Tom’s Trail. The out and back trail is a steel staircase that descends 500 vertical feet down the south canyon walls and takes you near the base of the Lower Falls. There is seating at the platform at the bottom, which makes for a perfect spot to have a snack. Relax and take your time because hiking back up can be strenuous, but there are benches along the way to rest. Please note that if you or anyone in your party is scared of heights, this might not be a good fit. 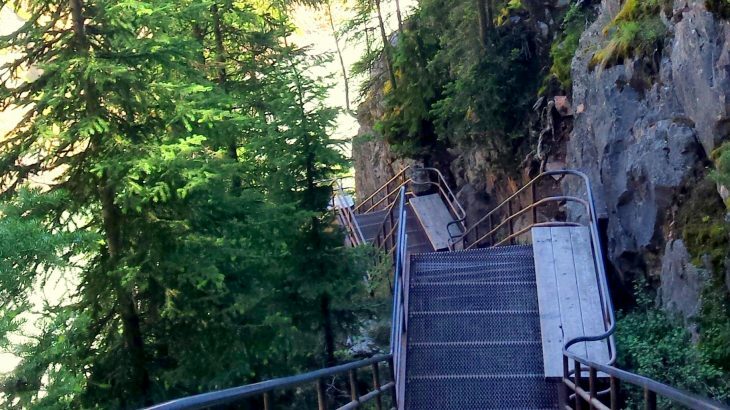 And this isn’t recommended while carrying a kiddo in a carrier unless you’re prepared to take the challenge of a strenuous hike up over 300 steps. Old Faithful is one of the top reasons for visiting Yellowstone and for good reason. It got its name due to its consistent eruptions (about every 78 minutes), and because of that, prediction times are posted all over the Old Faithful area. So if you’re at the diner, gift shop or Inn, you can prepare for the next eruption. My favorite part of watching Old Faithful are the moments leading up to the eruption. Even with hundreds of people on the platform, there’s a silence that falls over the crowd as everyone, in unison, waits for the magic to happen. Then as steam and water slowly bubble and shoot up into the air, hearing the crowd cheer and clap is a reminder of how nature brings us all together. The Inn is also a must-see while you’re there; then head over to the store to grab the ever-popular huckleberry ice cream or lollipops and enjoy them on the deck while you watch Old Faithful erupt again. Most visitors to the park only watch Old Faithful from the ground, but if you hike a third of a mile to Observation Point, you’ll get a different perspective of Old Faithful from 250 feet up. 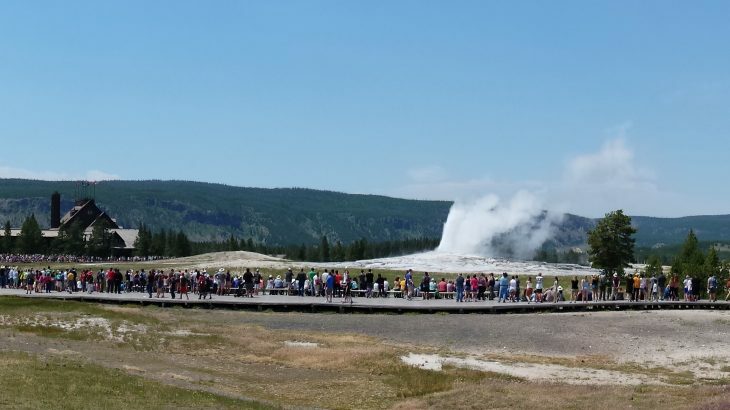 It’s a 1.1-mile loop to Observation Point and continues on to Solitary Geyser, which comes with its own interesting story, so make sure you read the nearby plaque. A good way to time your hike to Observation Point so you see Old Faithful erupt is to start as soon as an eruption is over. Given the estimated 78 minutes between eruptions, you’ll have enough time to find the trailhead and not feel so rushed. It’s a great place for a snack and some quiet meditation (or to let the kids run around) between eruptions. And if you leave after an eruption, by the time you get back, you’ll be in time for ANOTHER eruption. After you’ve had your fill of Old Faithful, head to the Visitor Center to look around and take note of other nearby geyser eruptions before making your way down the Upper Geyser Basin, which offers the most thermal features in one concentrated area. The trail from Old Faithful to Morning Glory Pool is paved and about 2.8 miles there and back – more if you walk along the boardwalks. But take your time – a few hours if you can – to explore and learn about the unique features within the Upper Geyser Basin. Early morning is a good time to explore before the crowds show up, and you can see steam rising above treetops in the distance. Also, have bug spray with you to combat the onslaught of mosquitoes in the area. Grand Prismatic Hot Spring is the largest hot spring in America (and the third largest in the world). 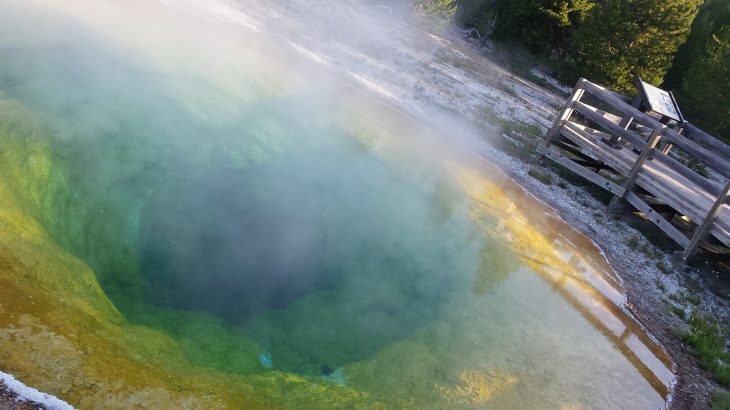 With its ghostly steam rising above the vivid hues of orange, yellow and green – a result of thermophile (heat-loving) bacteria that lives in the surrounding cooler waters – flowing from its deep blue center, it’s definitely a marvel. Nearby you’ll see Excelsior Geyser and Opal Pool and Turquoise Pool, but hold tight to your hat because the wind is notorious for tossing hats inside the fenced-in areas and you’ll never get it back again. 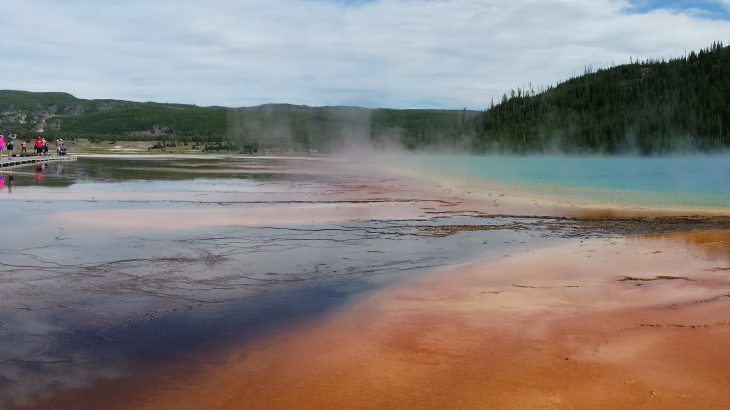 And keep your kids close as Grand Prismatic draws many tourists and the boardwalks can get VERY crowded. For a wide view, you can head over to the Fairy Falls Trailhead parking lot and take a .6-mile hike up to the Grand Prismatic Overlook. This is definitely one for the books! There are two areas within the park that are available and safe for swimming, which is great news for the kids after warnings not to get near any water in the park. Boiling River is in the Mammoth Hot Springs area near the North Entrance. Created by the hot waters from the hot springs and cool waters of the Gardner River, the temperature is great for relaxation for the entire family. 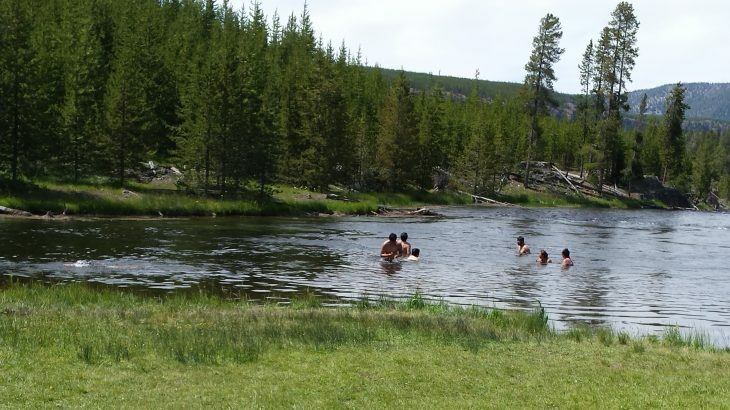 Further south near the Madison Junction is Firehole River. The river runs along a one-way road and if you miss the swimming spot (like we did), there are plenty of other areas further down for swimming – watch for cars on the side of the road. The waters here are shallow enough for kids, but bring water shoes to traverse the rocks beneath (flip flops will easily get carried downstream). Mud Volcano is another fun place for kids to explore, but don’t let the rotten-egg smell (sulphur) scare you back into the car. It’s a short walk on a boardwalk with some really neat features that kids will love. Mud Volcano is a constant rumble of boiling mud – its gray color a reminder of clay. Up some stairs, you’ll reach Dragon’s Mouth Spring. The kids will be most impressed by this feature as it’s a pool adjacent to a cave which, when it spews steam from its mouth, it rumbles and pushes water out of the cave opening – just like a dragon spewing fire. 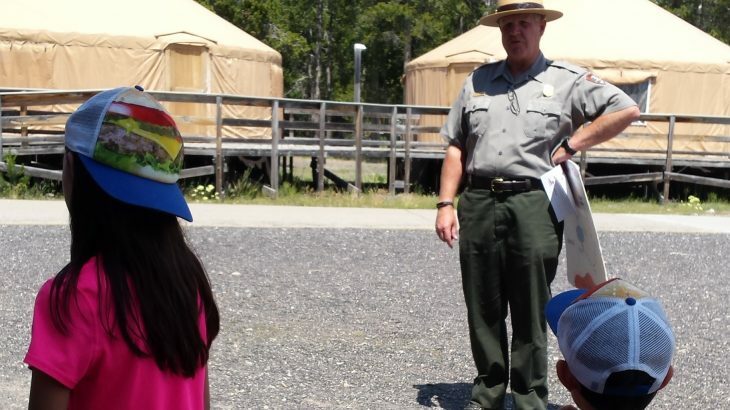 If you have time, take your kids to attend a junior ranger program. These are so beneficial in helping kids learn more about the ecosystem from experts who live and work in Yellowstone. 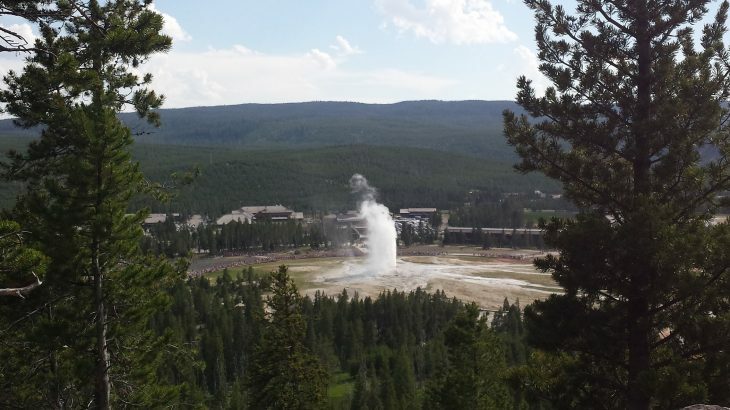 With Old Faithful’s popularity, we attended a program at Old Faithful to gain more insight about how geysers work. This is a great activity as it helps paint a picture of what is happening underground right before Old Faithful or any geyser erupts to promote an appreciation for nature’s handiwork. If you’ve been to Yellowstone National Park, what are some of your favorite kid-friendly things to do in the park? Please share with us in the comments below. Pictures courtesy of Vong Hamilton. Off Trail Hiking with Kids, Itineraries Across America, Yellowstone National Park, Yellowstone National Park with kids. permalink.